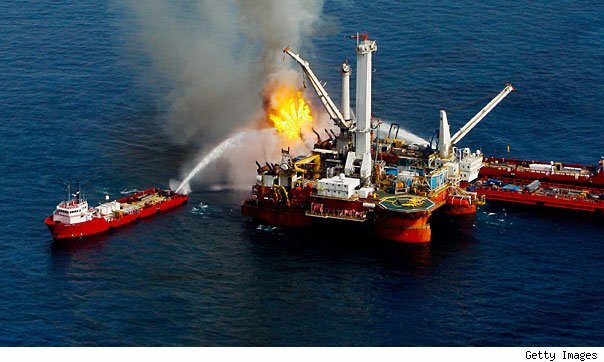 Feb 21 - Nearly three years after a deepwater well rupture killed 11 men, sank a rig and spewed 4 million barrels of oil into the Gulf of Mexico, BP (BP) and the other companies involved are scheduled to face their judge in court. "This is a game of corporate chicken," said John Zavitsanos, a Houston civil litigator. "We have tangled with BP often, and they blink." Joining well owner BP Plc in Judge Carl Barbier's courtroom will be rig owner Transocean Ltd (RIG) and well cement services provider Halliburton Co (HAL). "If the first couple of days are good for the plaintiffs or good for the defendants, that could shift. Once the first pitch is thrown, those odds could change," said Anthony Sabino, a business law professor at St. John's University School of Law. Just ahead of the trial, BP won agreement from the Justice Department to exclude 810,000 barrels from the total spilt barrels estimate, but BP says the estimate is still too high. It also wants "efforts to do the right thing" afterwards taken into account and has earmarked only $3.5 billion for Clean Water Act payments, compared with its potential maximum liability of $17.5 billion. "With the federal government out of it, he (Barbier) might well postpone ... particularly if the states indicated to him that they were continuing to talk," said Ed Sherman of Tulane University Law School in New Orleans. The civil claims to be covered next week could surpass these, and the trial's significance to BP was evident at a Feb. 5 news conference in London. When Chief Executive Bob Dudley said the company would vigorously defend itself, he repeatedly looked toward his top in-house lawyer, Rupert Bondy, for moral support. BP has repeatedly said it will settle on "reasonable terms," but Bondy drew a line in the sand this week, saying the British company now goes to trial "faced with demands that are excessive and not based on reality." If BP is found "grossly negligent" - a key question for the trial - its fine under the U.S. Clean Water Act could be as high as $17.5 billion based on a total of 4.1 million barrels spilled and a maximum fine of $4,300 a barrel. It could also be much lower, at a maximum $1,100 per barrel, or $4.5 billion, if BP's claim that it was "no more than negligent" is proved. "It is very difficult to prove, and that is something that these defendants are counting on," Sabino said. Steve Herman, one of the lead lawyers for the plaintiffs, said they contend there is "overwhelming evidence" that BP, Transocean and Halliburton "were all grossly negligent, and we look forward to laying bare that evidence for all to see." Alabama Attorney General Luther Strange, who will speak for the states in the trial, agreed that the evidence would show BP's conduct reaches the level of gross negligence and said expert testimony would prove "very, very damaging to BP." Strange said he plans to present BP with declarations that the spill was both predictable and preventable, and that the company fosters a "culture of callousness." "It's a focus of profits over safety," he said in an interview on Thursday. The companies have consistently held that whatever mistakes were made, they don't rise to the level of gross negligence. But on Thursday, Barbier rejected BP's request that the plaintiffs not be allowed to present evidence regarding its suspension from obtaining new federal contracts following the spill, imposed last year by the U.S. Environmental Protection Agency. The plaintiffs said that evidence may be pertinent after the first phase, so Barbier said BP could try again to block it if the issue arises once the case starts.